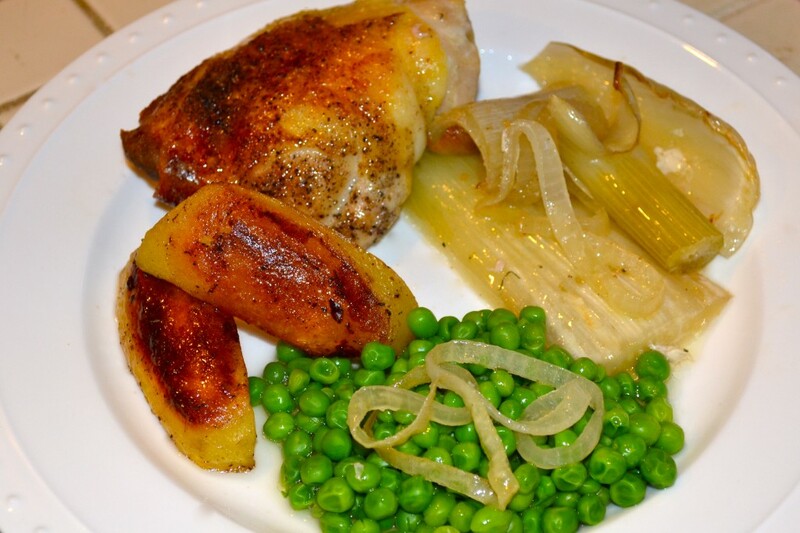 Roasted chicken pieces is an easy weeknight meal that I usually have as a go to with packages of chicken in the freezer ready for early morning move to the fridge or counter to defrost for that night’s dinner. I am perpetually playing beat the clock with 3 boys and a full-time job…it can be pretty hectic around here. This roast chicken is a no brainer, I can make it in my sleep, purchasing the chicken already cut up instead of doing it myself is a great shortcut. Early in the morning I start by taking the chicken out of the freezer and placing on a plate on the counter to defrost as I begin the boys breakfast. If I have an abundance of time I will make them a hot meal of scrambled eggs & toast or waffles, etc. If I am running behind then I prep the counter with cereal bowls, boxes of cereals, spoons and a pitcher of milk. This is the way my mom has always made this dish and I am not one to mess with success so I do it the same way. Preheat oven to 350 degrees. 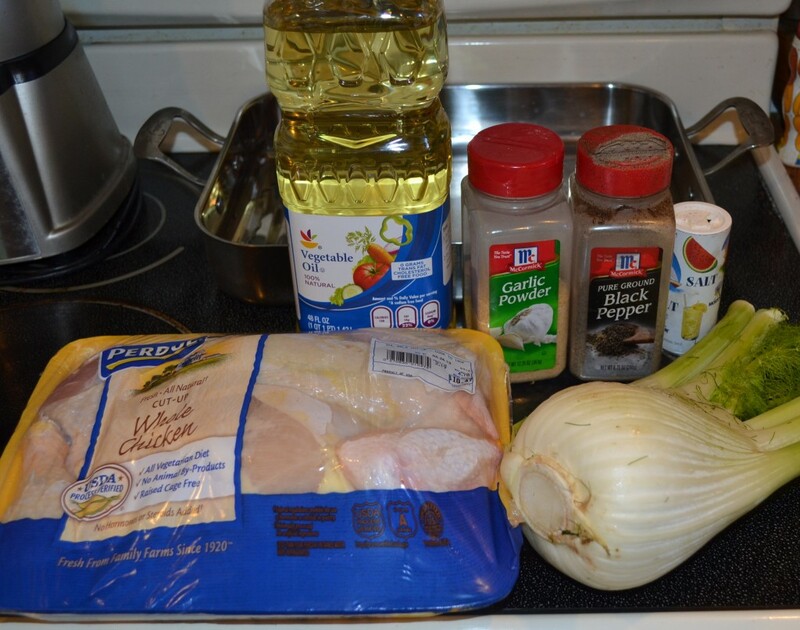 One package (defrosted) whole chicken cut up into 6-8 pieces, one large fennel bulb, vegetable oil, salt, pepper, and garlic powder. Start by placing the chicken into a colander and giving it a good rinse. Set colander aside to drain and prep your vegetables. Slice the fennel and a large white or Vidalia onion. Set aside on your cutting board as the veg are going right into the roasting pan. Add a little bit of vegetable oil in the bottom of the roasting pan, drop in the veg and stir it all around so it is coated with oil. 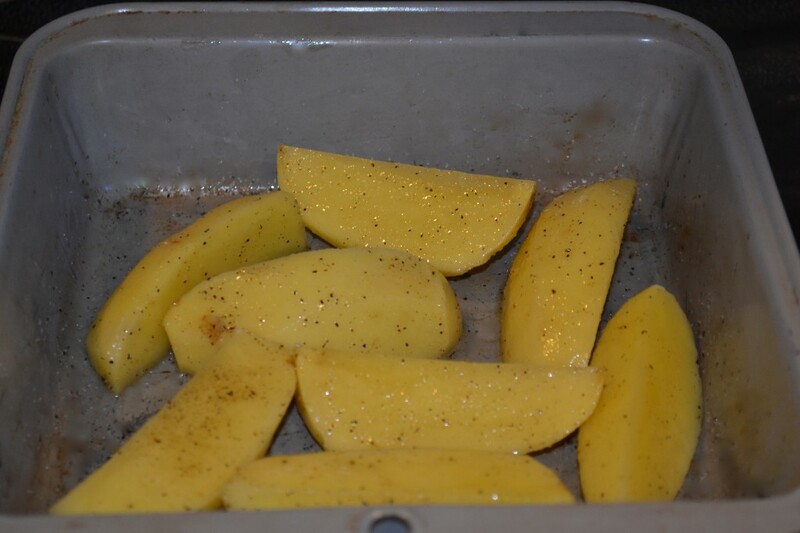 Sprinkle salt, pepper and garlic powder all over the top. Next go back to the chicken that has been draining in the colander. 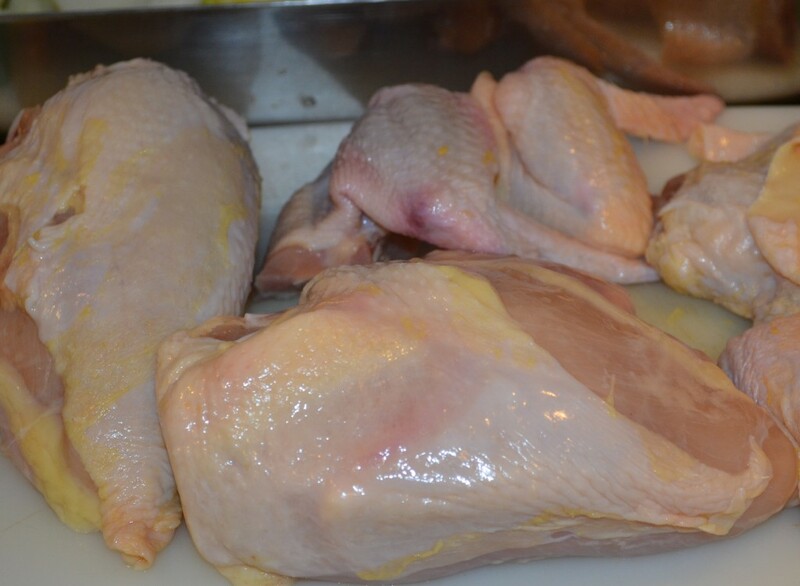 Place chicken on a cutting board and proceed to pat each piece dry with a paper towel. 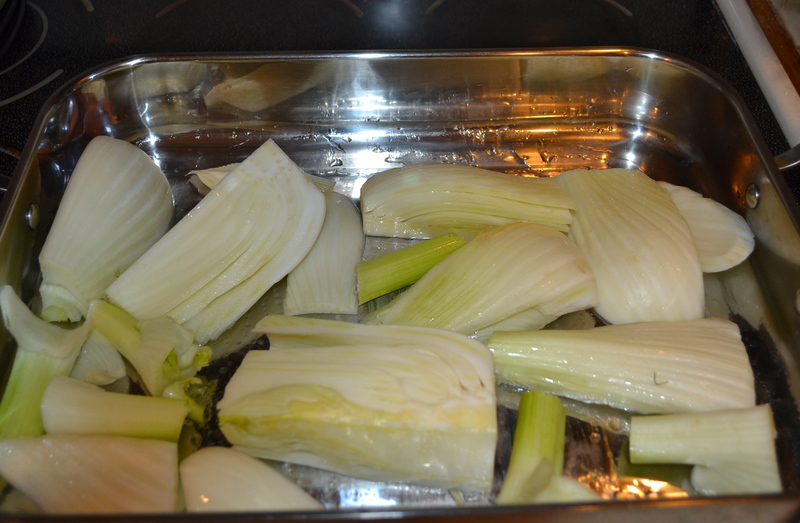 When every piece has been dried put them into the roasting pan on top of the fennel and onion. Make sure there is a little room around each piece of chicken. Don’t lay them on top of one another. 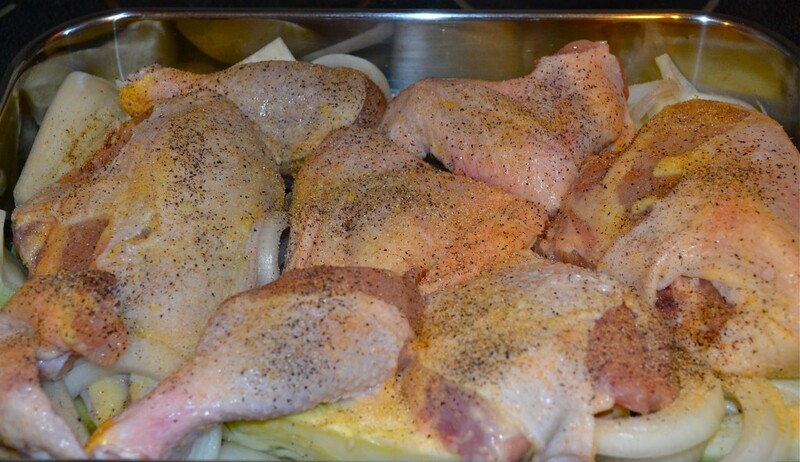 Season with salt, pepper, garlic powder and any other seasonings you are partial too. Some of my favorites are thyme and rosemary. 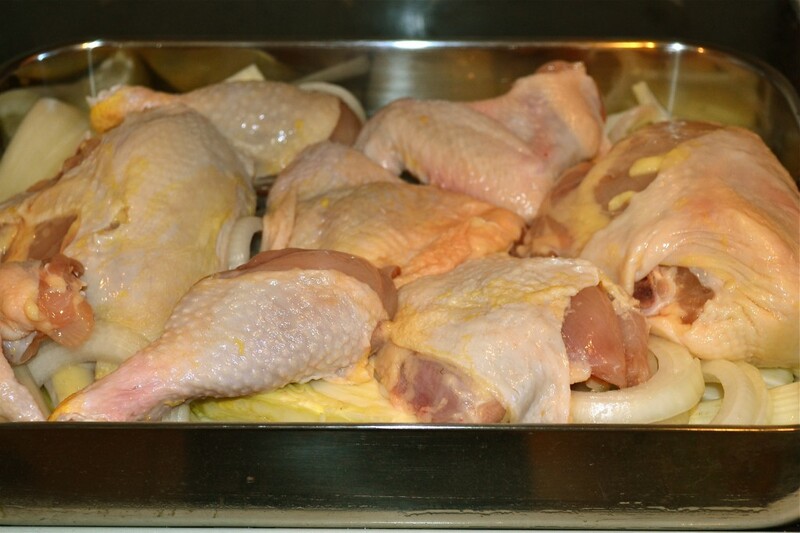 The roasting pan looks crowded but trust me it is not and the chicken will roast up crispy and delicious! Into the oven at 350 degrees for about 45 to 60 minutes. 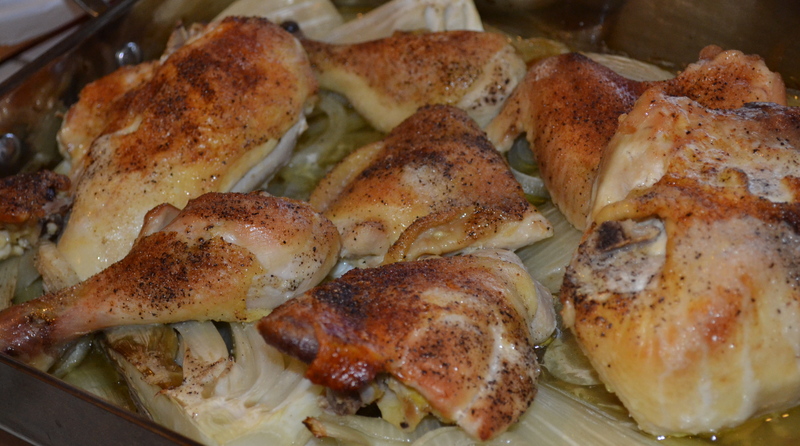 Roast the chicken until the juices run clear when pierced with a knife. Internal temperature will be 165 degrees. I cannot give a precise time as oven temperature’s vary so you really need to know your oven and test the chicken with a meat thermometer after 45 minutes. Yukon gold potatoes, peeled, sliced into wedges, coated in olive oil, salt & pepper. 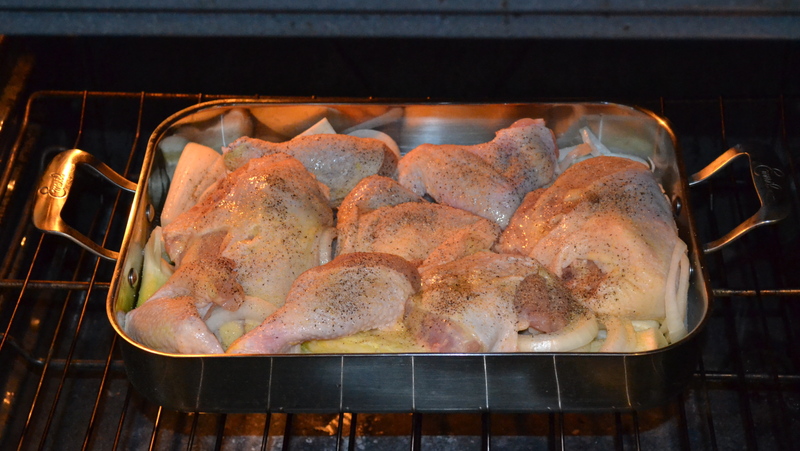 Roast in the oven with the chicken for the least 30 minutes. The potatoes will not take as long as the chicken. This meal will feed four of us (hubby not home for dinner) with no leftovers. We are having a big snowstorm in New England tonight so my best wishes to everyone! Stay safe and warm! 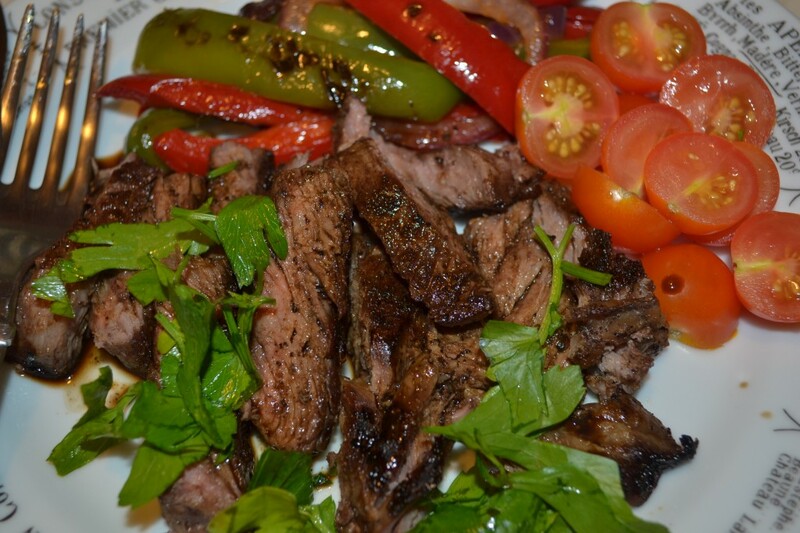 I make a very easy & tasty steak, peppers & onions. My kids love it and I make it a couple of times a month for them. I have to admit that I am not one for leftovers and rarely does it happen that there is any food left after the meal but this is one dish that is just as good the next day with a hot, crusty loaf of bread. 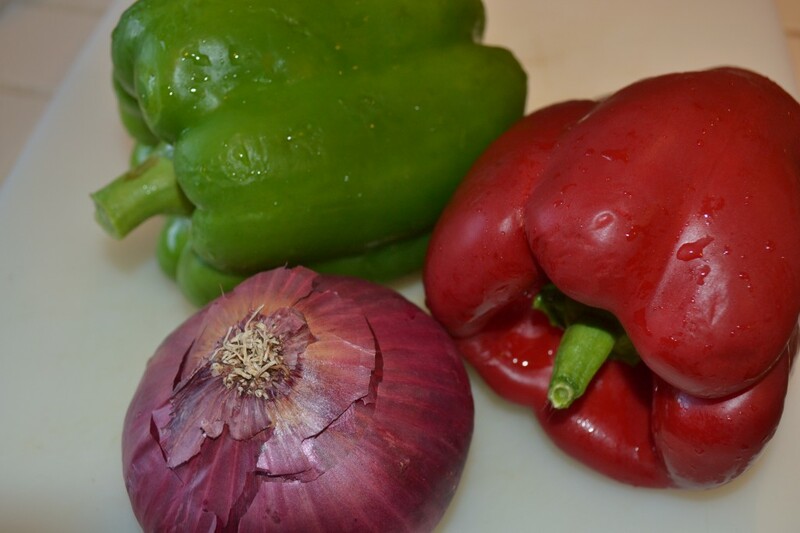 So, start with fresh peppers and an onion. 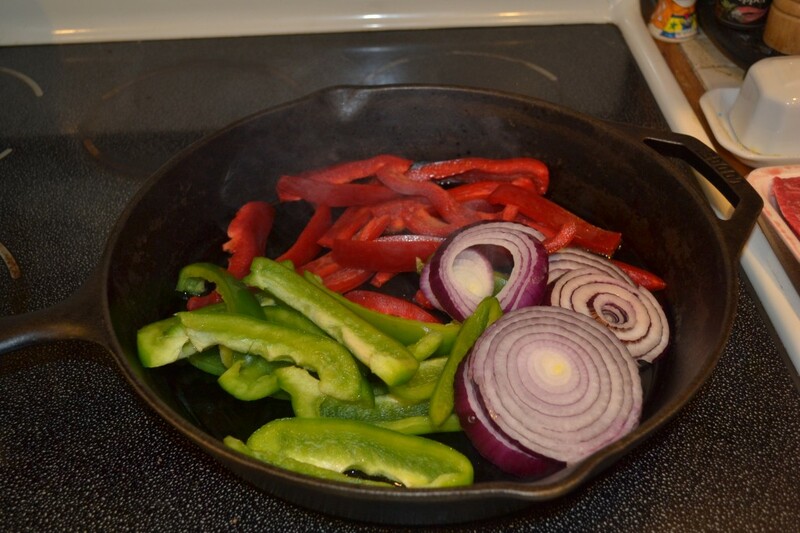 I prefer red onions but yellow or sweet Vidalia would be just as tasty. 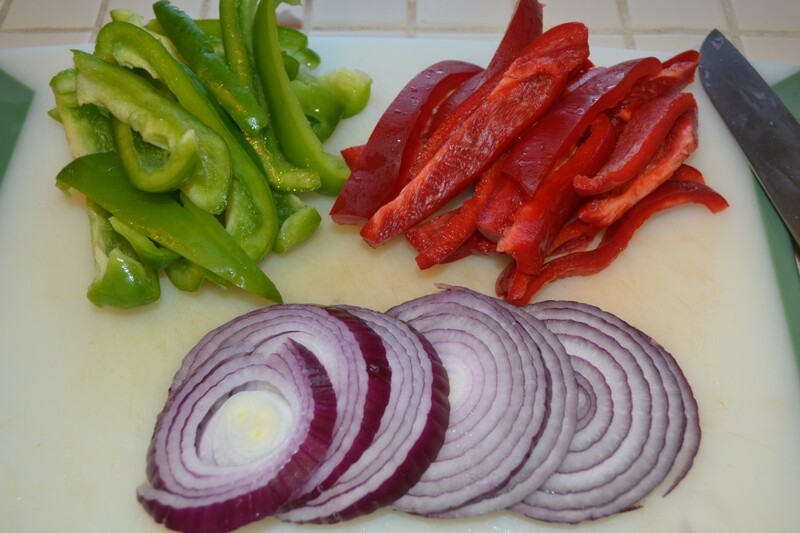 I slice up the peppers into even sized strips and the onion into rings. I use sirloin tips from the grocery store. The butcher in town can be a little pricey and I have had good luck with this cut from my regular grocery store so it’s what I stick with for this recipe. 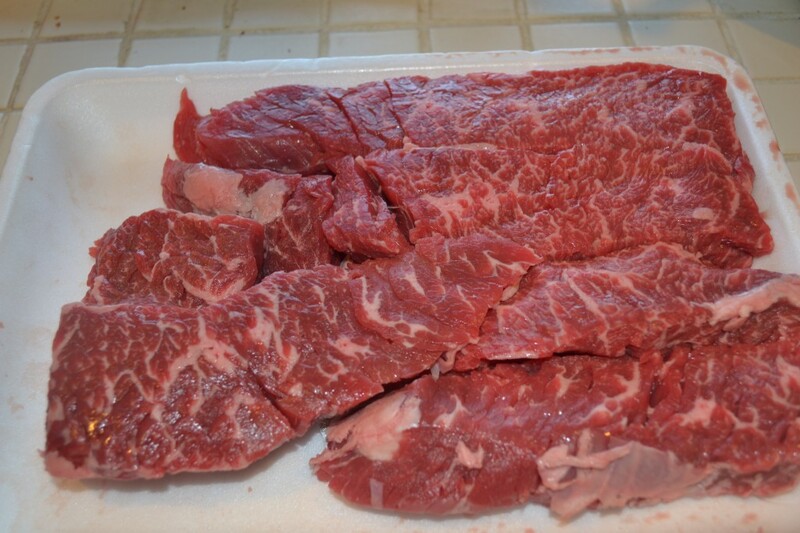 Rinse your steak, set aside and pat it nice and dry with some paper towels. Season with salt, pepper, garlic and a little olive oil rubbed all over. The marbling in this steak is what gives it great flavor and it melts away during cooking to leave the steak tender and juicy in each bite. 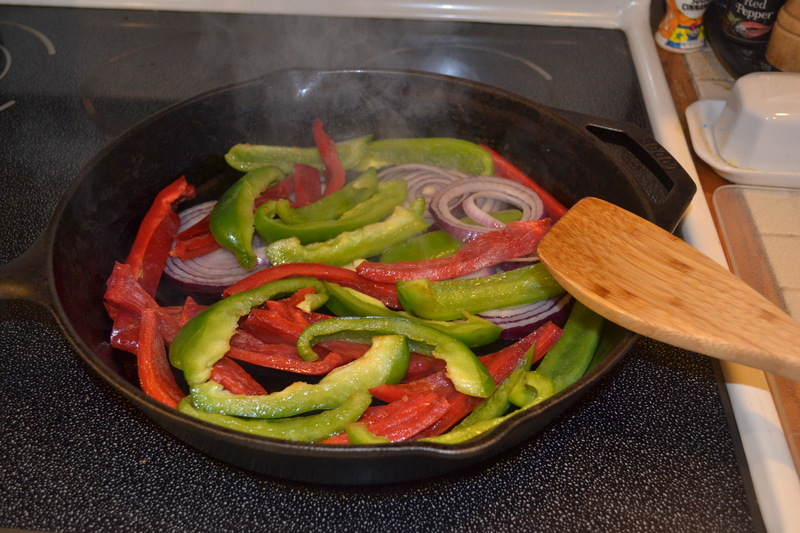 Into a hot cast iron skillet, with a little olive oil, I slide in the vegetables on medium high heat. Season with salt & pepper and stir so the vege’s do not burn but soften with just a little bite left to them. I prefer them this way but if you like them softer then of course cook them longer and to your liking. Reminder, stir your vege’s so they don’t scorch. Once the vege’s are finished remove them to a plate and set aside. I cover mine to keep them warm. 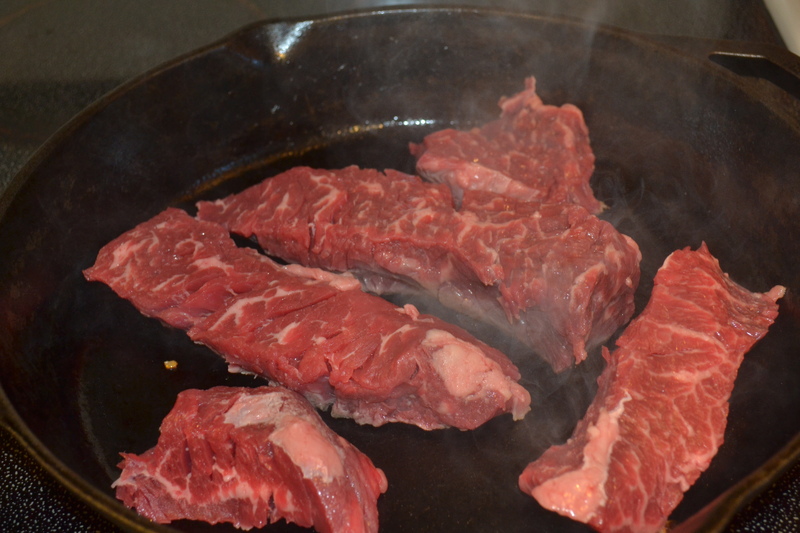 Add a touch of olive oil to the skillet and then drop in the steak. Not all of it at once, if you overfill the pan with steak the juice released will end up stewing your meat instead of searing it. If you have pre-seasoned your steak then you are good to go. Let it cook on both side to the wellness you and your family like. We like steak to be medium well. I can tell the doneness by pressing on the top of the steak with my tongs. The amount of resistance tells me how well done the steak is. It takes some practice and again it comes down to timing. 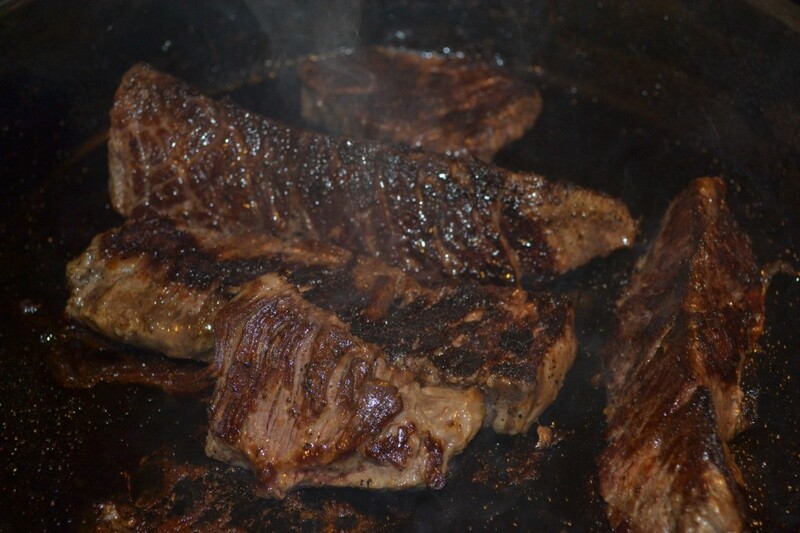 For these strips of steak and at medium high heat I cook each piece a total of about 15 minutes. They are pretty thick overall so it may seem like a long time but it takes a bit to get those centers to the right amount of doneness for my family. Once finished I remove the steak to a plate and go on with the remaining pieces. Set aside your finished steak for 5-10 minutes to let the juices settle then carve away. I plate up dinner for my brood with a side of fresh cherry tomatoes (from my garden when in season) and some fresh parsley, roughly chopped/torn. This meal feeds five of us with no leftovers but if we have any of the boys friends over then I make double the recipe. Growing boys eat a lot! My oldest is growing taller everyday and his appetite seems to be growing in proportion.